Betty & Walter launched in 2012, created by British designer Lisa Levis (nee Stickley) who is known for her unique and illustrative prints. Inspired by mid 20th century design and influenced by people and places significant to her, Lisa’s designs begin life as drawings and paintings by her own hand which are then made into accessories which are feminine, practical and easy to use; complete with well thought out functionality and attention to detail. Bags and purses come with quirkily hidden printed pockets, brilliantly bold blocky handles and considered features. 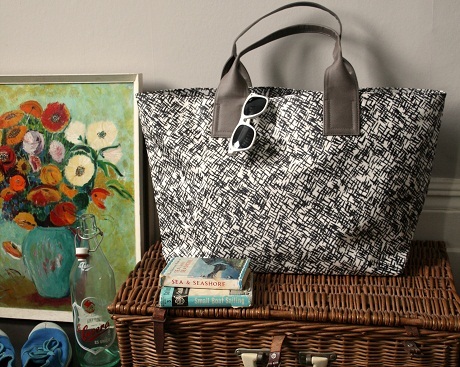 The Betty & Walter bag does its job whilst being wittily stylish at the same time. With mugs, tea towels, aprons and frilly pinnies also available there is no excuse not to include a cheery addition to your kitchen too! Betty & Walter is named after Lisa's aunt and uncle who lived in The Bungalow on 5 Elms Road. Being cattle dealers for the local farm, most working days were spent at cattle markets and the rest of their time was filled with cooking steak and kidney pie, tending to honeysuckle and harvesting raspberries, going to parties to play Matchbottle and Newmarket and drinking Camp coffee!